This is one that's been "on the list" for quite some time! This is a very colorful custom piece I'm doing for one of my most colorful friends. :-) I think she might own more of my originals than anyone else. This kinda dates back to when I was tinkering with what I called "Fantasy Fowl" which were drawings of chickens that had the plumage color of other species of birds. I seem to recall she had a title picked out but I can't recall what it is right now! 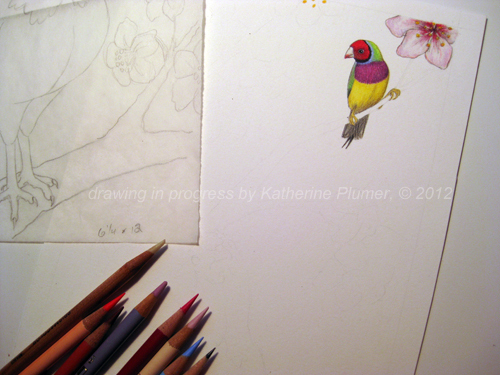 That is a Gouldian Finch, native to Australia, beautiful little birds, lovely artwork. HOORAY! I figured you would need to wait until post-move to do this piece! You will need to find ALL of your pencils from all of your moving boxes! There are soooo many colors! -BMc.